First impressions matter. If you are unable to smile confidently because of stained, damaged teeth or dental disease, our cosmetic dentist in West Hollywood can help. We can erase years of stains using powerful prescription-strength teeth whiteners that can be applied in our office and activated using high-intensity lights or with take-home trays that are customized to the unique contours of your smile. Our Blue Shield HMO dental insurance dentist in West Hollywood can use tooth-shaped porcelain shells to conceal discolorations, chips and other flaws for a bright, beautiful smile. A conservative alternative to crowns, inlays and onlays can be used to restore function and strength to damaged or decayed teeth. We can use crowns to support dental bridges, with dental implants to replace missing teeth or to restore severely damaged teeth. The right orthodontic treatments can straighten even the most crooked smile. Replace missing teeth with the most natural possible restoration available today. Dental implants can be used with porcelain crowns, dental bridges or dentures. Cavities can be filled subtly and attractively with fillings that are matched to the natural color of your teeth. Bridges can be used to replace one or a few missing teeth and can be supported by abutment teeth or dental implants. Dentures are removable restorations that can be used to replace several missing teeth or an entire arch. Gum disease can threaten your oral health, but we offer periodontal treatments that can get you back on the right track. Biannual checkups play a critical role in the maintenance of your dental health. 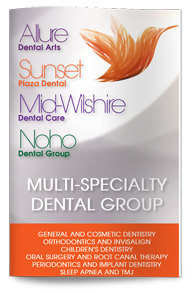 Contact our West Hollywood Blue Shield HMO dental insurance provider today to learn more or to schedule your next checkup.